The unpleasant effects of stinging eyes, irritating or dry skin, acrid chemical smells are mostly eliminated. These are generally caused by mono-and di-chloramines formed by the reaction of ammonia/ammonium (present from the breakdown of human organic detritus) and the chlorine used for disinfection. Zelbrite by removing ammonia/ammonium from the water prevents the formation of these irritating and dangerous compounds. Water quality and health specialists believe that some of the compounds formed between the interaction of ammonia/ammonium, organic contaminants and chlorine are potentially carcinogenic. By removing ammonia/ammonium and organic contaminants with Zelbrite pool filtration media before they interact with chlorine, the risk of forming these dangerous compounds is dramatically reduced. Bacteria causing infections and disease seek protection wherever they can. They will inhabit the dirt particles in a pool and to some extent be protected from chlorination. By providing a cleaner pool, Zelbrite enhances the effectiveness of chlorination to eradicate these bugs and provide a safer and healthier swimming pool. The greater dirt-holding capacity of Zelbrite means that there is less frequency of backwashing and hence less discharge of wastewater to the environment. The chemical action of Zelbrite and its "buffering" capacity results in a more efficient use of chlorine and a reduction in other chemicals used for pH control. As a result the total dissolved solids (TDS) discharged to the environment is lower. Although Zelbrite will initially cost more than filter sand, a consideration of economic benefits shows that 'life-cycle' costs for swimming pool filtration are in fact much lower. As the frequency of backwashing is lower, this can give considerable savings in water costs. As the backwash water contains 'heat' and chemicals that have been applied, these have to be replaced. Therefore there are immediate savings from less frequent backwashing in water costs, heating costs and chemical cost. Backwashing has often been reduced by up to 50%. The more efficient use of chlorine (resulting from the removal of ammonia/ammonium and organic contaminants) leads to very significant reduction in chlorine usage. Typically chlorine usage reductions of 30% or greater are achieved. The natural 'buffering' characteristics of Zelbrite and lower use of disinfectants results in lower use of chemicals (such as carbon dioxide) for pH control. 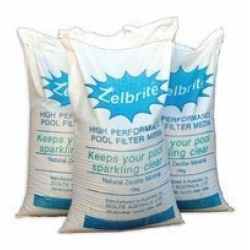 The less dense nature of the Zelbrite filtration particle and its specific structure results in the filter medium being less restrictive to water flow than sand. This manifests ultimately as a saving in power/electricity. With specific equipment such as salt chlorinators (installed downstream of the Zelbrite filter) the electricity consumption is less. This results in the extension of the plate life of the chlorinator. These remarkable economic savings in the use of Zelbrite filtration medium are not achieved with alternatives such as sand or diatomaceous earth. HEALTH: (explained in English)Â Zelbrite absorbs ammonium ions from the water.Â Ammonium ions are created by organic matter in the water, such as urine and sweat.Â When they react with chlorine ions, they form trichloramine, an easily inhaled gas, which is a well known cause asthma related problems, especially in children. So ammonium ions are removed by passing water through a filter using Zelbrite media.Â Over time however, the Zelbrite becomes saturated with the ammonium ions.Â That is why the manufacturers recommend that you regenerate your Zelbrite once a year.Â It is a very simple process.Â It comprises adding sufficient pool salt to the filter to produce a 10% concentration, leaving to stand overnight and then backwashing two or three times.Â Even salt water pool owners need to do this, as the level of salt in their pool water is not concentrated enough to be effective.Â Failure to regenerate your Zelbrite will not effect its performance, it just wonâ€™t remove the ammonium ions after time. 4.Â Â Remove the backwash valve from the top of the filter. 5.Â Â Leave the water in the filter. 9.Â Â Allow to stand overnight before back washing and rinsing (about 3 times) ensuring the pump is turned off before turning the backwash valve handle. We have for sale bags of 25kg pool salt for $7.70 inc GST. So as you can see the process of regeneration is simple, cheap and beneficial for the health of you and your family. If you have any further questions about Zelbrite or the chemicals you currently use, please do not hesitate to call us. Donâ€™t forget to look after your pool over the winter months.Â Itâ€™s cheaper to keep it clean than let it go green!